The company sold 1 million consoles in less than 24 hours, it said, putting it roughly equal with the launch of Sony's PlayStation 4 a week earlier. Gamers on both platforms have been waiting several years for the companies to update their hardware, so strong sales at launch shouldn't come as a surprise. 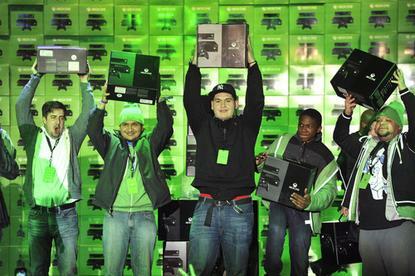 "We are humbled and grateful for the excitement of Xbox fans around the world," Microsoft said. Many of the 22 Xbox One games available at launch are played online, enabling Microsoft to collect data from its servers about the frenetic first day of gaming. It said more than 60 million zombies have been killed in "Dead Rising 3," more than 3.6 million miles driven in "Forza Motorsport 5" and more than 8.5 million enemies defeated in "Ryse: Son of Rome." The Xbox One has been well received by critics, who praised its graphics. The console's non-gaming features, such as the ability to access live television in some countries and integration of Skype, have also been noted. With both Sony and Microsoft's consoles launched, game retailers and software makers are hoping for a strong holiday season.